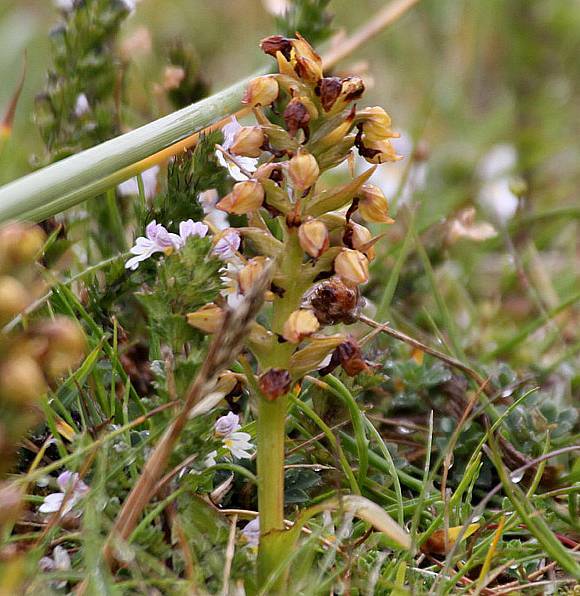 A short orchid, only between 5 to 15cm tall and rarely up to a foot. Between 3 and 5 strap-shaped basal leaves. Compact flowering spike, some plants having prominent long bracts, as here. A short compact cowl of three sepals forming a globular shape. 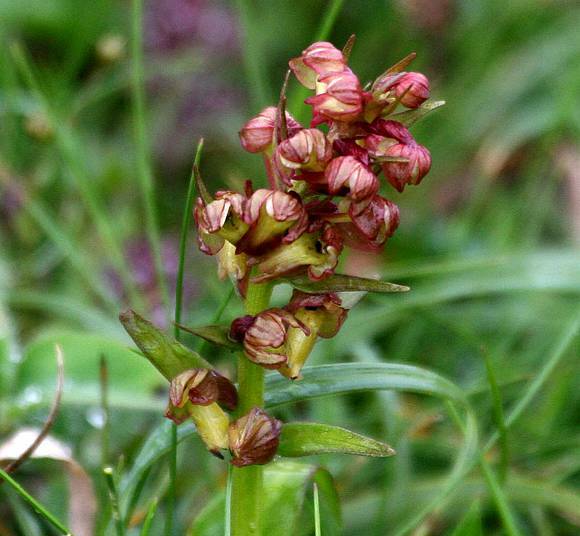 Sepals green in wetter conditions, reddish in dryer conditions. 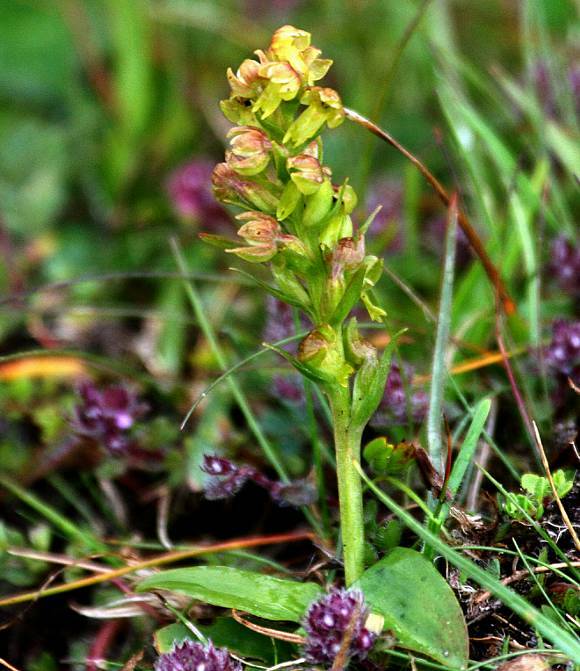 A long, greenish, almost parallel-sided tongue with three short rounded lobes protrudes from the cowl of sepals. Basal leaves have but one vein. Depending upon the moisture content of the soil, the flowers can be either reddish-brown (dry) or yellowish-green (wetter) as here. Red cowl indicative of drier conditions. The long green tongue has two longer outer lobes, and a shorter middle lobe (dead centre). A spent flower going to seed. An Eyebright behind. Tapering bracts at intervals along the stem and amidst the flowering spike point upwards, and can be long in some specimens. The lip, paler in colour than the hood, is long, parallel-sided and has three short lobes keeping within the profile of the lip (central flower). The lip folds back under the ovary (the 'stalk' of the flower in orchids). Overall this gives the impression of a frog with hind legs outstretched at the back. Common Spotted-Orchid (Dactylorhiza fuchsii) in Wiltshire. Southern Marsh-Orchid (Dactylorhiza praetermissa) in Co. Down, Ireland. 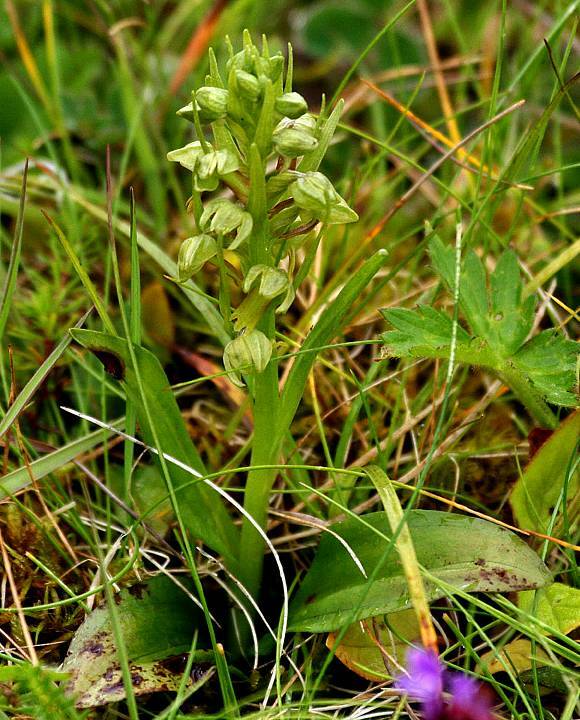 Northern Marsh-Orchid (Dactylorhiza purpurella) in Scotland. 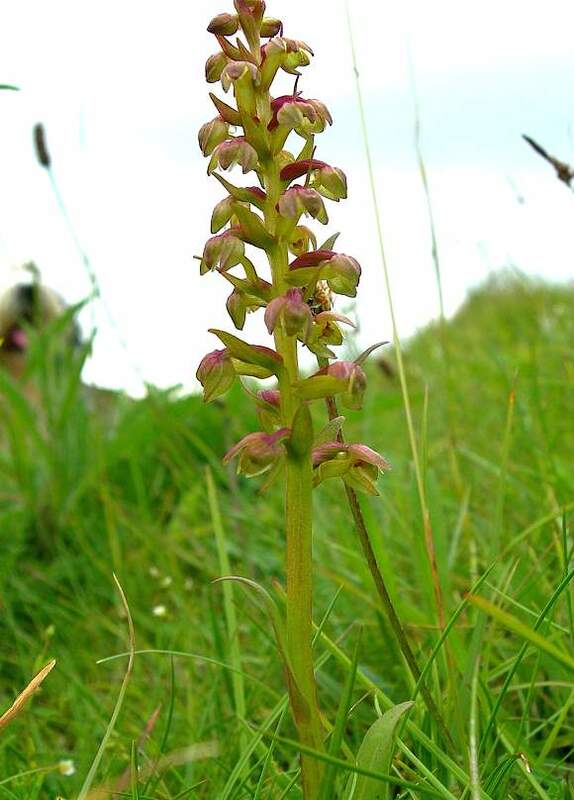 Fragrant-Orchid (Chalk) (Gymnadenia conopsea) (and probably the other two Fragrant-orchids) in several Counties. 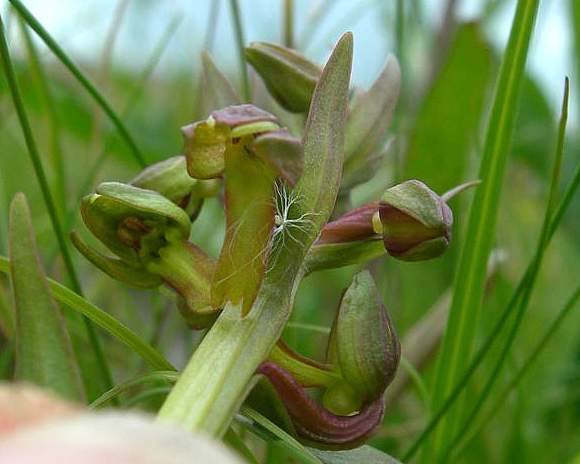 Lesser Butterfly-Orchid (Plantathera bifolia) in several Counties. All these hybrids are rare. No relation to : Frog Rush nor with Frogbit (Hydrocharis morsus-ranae) [plants with similar names belonging to differing families]. Flowers late June to early September. 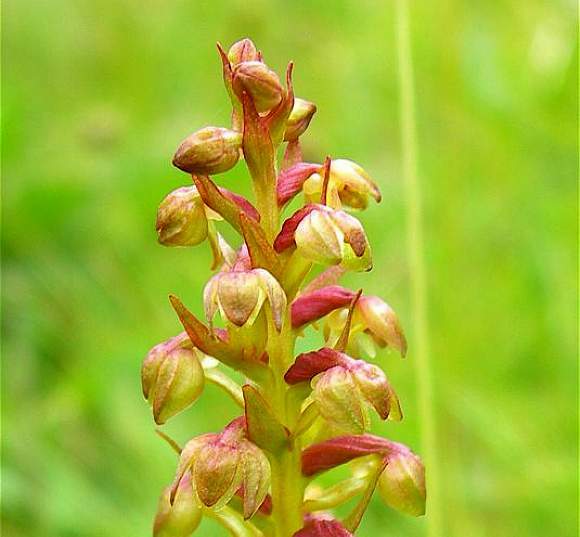 The colour of the sepals varies depending upon the moisture conditions of the soil: yellow-green in wetter sites, and red-brown in drier ones. The yellow-green ones give rise to the specific epithet part of the scientific name viridis. The spur at the rear of the flower is a very short 2mm long. Habitat in the South is on grassy places and short turf on limy soils, elsewhere it grows in meadows, mountain ledges or dunes. Flowering in specific places is erratic from year to year, but sometimes individual specimens can flower 7 years contiguously.